Fits all 3 door Mk7 Fiesta and with some little extra work will fit the USA / Global 5 Door also. Fits all 2009 onwards spec fiesta 3 door models (5 door will need extra work around the rear doors only). Easy bolt on front wings/fenders and front bumper. Bond on Full Rear Arch Panels. Made From GRP and coated in white gel coat for quick easy preparation for prime and paint. No other Fiesta Body Kit comes close! 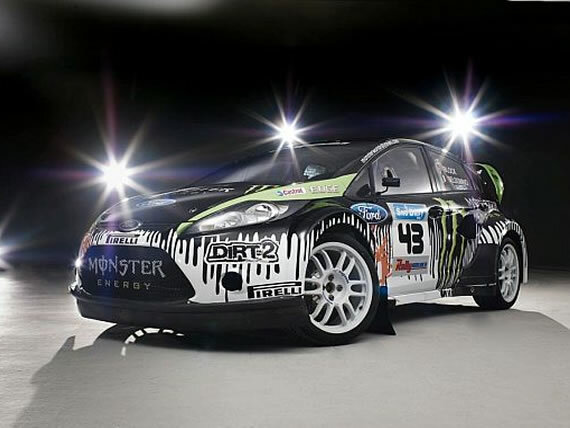 As used by Ken Block, Tanner Faust, Andreas Eriksson and professional rally driver Marcus Grönholm. This kit has the lines and presence other kits dream of, if you want the ultimate Fiesta, this is the one!!! Optional Rear Spoiler is available cost is 1600+vat. For fitting on the 5 door model, you will need to dry fit the rear quarter panels and cut down the normal door opening line to enable the rear door to still open. Pumaspeed have only fitted the kit to 3 door models.The Ken Block USA spec car has the 5 door bodyshell and will show you the line to cut down from google images. The USA model Fiesta does not differ in any way from the European spec car, so all parts will fit totally. Please be aware this item is very large and may be subject to additional delivery charges for many non-UK destinations. Please note that this kit will Not fit a 5 door car without adaptation. The Pumaspeed Workshop team are ready to fit the Ford Fiesta Mk7 Bodykit by Olsbergs MSE (as used by Ken Block) in our Head Office located here. We estimate the labour time to be approximately 60.00 hour(s) costing £4,680.00 inc VAT. Therefore making parts and labour a total cost £6,430.00 (inc. VAT). Pumaspeed have a specialist distribution team that can dispatch the Ford Fiesta Mk7 Bodykit by Olsbergs MSE (as used by Ken Block) to any destination worldwide.